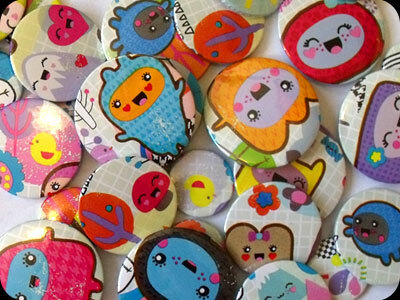 These badges are made from fun, smiling character wrapping paper also featuring trees, flowers and geometric patterns. They are a mixture of sizes, measuring either 25mm, 38mm or 45mm. Below are all the badges I have made in this style. Click on any for a closer look.